Here in Boston Filene’s Basement is shutting its doors for good in a few days. I walked into the Newbury Street store last week, but I didn’t have the stomach for picking through a carcass. Nothing lasts. Not Filene’s. Not Woodward & Lothrop. Not Gimbels. Not even the idea of a Downtown. On Saturday afternoons of my childhood, my mother and I took the Connecticut Transit bus that stopped in front of our house and headed east to G. Fox & Company—downtown Hartford’s largest department store, and land of the crisp navy blue shopping bags. We’d get off at the corner of Asylum and Main, and walk a block to the bustling commerce of G. Fox’s eleven floors. The grand escalator that made G. Fox such an adventure for me was just past the fragrant counters of cosmetics and perfume. The slow moving silver escalators gleamed affordable luxury. Our first stop was on the fourth floor for lunch in the Connecticut Room. The Connecticut Room was wallpapered with scenes of Connecticut history, an involved pictorial narrative that had no obvious place for me. The hostess handed me a red crayon with the children’s menu and sat Mom and me where we had a good view of the Saturday fashion show. The elegant models mingled on the floor with uniformed waitresses who served lunches in the same unobtrusive way they had done for decades. Those downtown Saturdays, my mother splurged on beauty. G. Fox’s eleventh floor smelled of that beauty hard at work—hot wax, nail polish, and hair dye. If we had time, we’d pop into J.J. Newberry across the street—a five and dime store that was all linoleum flooring and plastic bins. My mother searched for glittery green and blue eye shadows and thick-as-a-brick red lipsticks. I’d paw through the bins looking for anything shiny. And sometimes I would emerge with a treasure like the brown plastic purse in which I could see my reflection. Other Saturday afternoons my mother and I changed direction and headed west to Lord & Taylor. The store was a chunky white brick building autographed with the inimitable black script that announced its name. Its gravitas defined Bishop’s Corner. All my mother and I had to do to get there was to cross the street and catch the Asylum Avenue bus crawling the nine-tenths of a mile to North Main Street in West Hartford. My father had measured the distance so he’d know precisely how far he walked on his daily pre-dawn strolls. My mother never needed money at Lord & Taylor. Mrs. K. Harold Bolton said the raised lettering on the green store card. “Thank you, Mrs. Bolton,” said the sales ladies at the end of every transaction. Mrs. K. Harold Bolton and I joined the other ladies lunching on the second floor of Lord & Taylor at the Birdcage. Mom ordered iced tea—smooth liquid amber that put me in mind of her sweet singing voice—and a small tossed salad to stay a size 6 and to feel entitled to share my chicken salad sandwich. Wire cages—absurd mobiles—dangled from the Birdcage’s ceiling. Pastel birds, which against all odds were real, chirped in the cages. The waitresses pushed carts of tea sandwiches and precious deserts. Nothing steaming, nothing sliding down mounds of grease. The Birdcage was the epicenter of politeness and good manners. I still miss the grand, multi-storied department store. I miss the silver-toothed escalator that snaked its way from the bottom to the top of G. Fox. 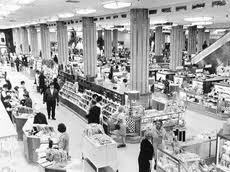 I miss the thrill of the hunt in a space big enough to buy a winter coat on the fourth floor and a 45RPM record on the eleventh. I miss the way Mom and I changed worlds—from suburban to urban—in a fifteen minute bus ride. But most of all I miss that Downtown Hartford feeling where I once stood at the center of the universe waiting for a bus. When I heard that Leslie Starobin, a Boston-based artist, was looking for first generation Jewish immigrants from Latin America for her series of montages called “The Last Address,” I got in touch with her. She was thrilled to hear from a Cuban-American Jew — a so-called Juban — and felt it was fortuitous that I was virtually right in her backyard. I didn’t have much to offer Leslie in the way of the physical objects, such as the clothing, visas and report cards that are often central to her work. “Castro took everything” was the refrain of my childhood. What I do have is a picture of my mother at 19 in which her lips are dark and her eyebrows are arched like a movie star’s. Compiling a family’s oral history is integral to Leslie’s artistic process. To that end, Leslie extensively interviewed my mother, who remembered that she sat for the picture at a photographer’s studio in downtown Havana after a long day of classes at the university. My mother also told Leslie her signature story. “I still see Manzanito after he was gunned down. We called him Manzanito because his cheeks were red and full — like little apples — manzanitos.” Manzanito was Jose Antonio Echeverria, the president of the University Students Federation, who had led an attempt to overthrow Fulgencio Batista by storming the presidential palace. 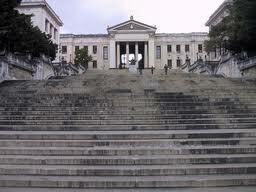 On March 13, 1957, Echeverria was slain by Batista’s henchmen — only steps away from the famous staircase leading into the University of Havana. My mother has recounted taking a quiz in a nearby classroom when she heard the gunshots. “Your mother told you that she went to the University of Havana?” asked Olivia Kantor, who knew my mother in Cuba, and was friendly with her after they both immigrated to Brooklyn. She was surprised — more surprised than when I called her out of the blue and introduced myself as Harold and Matilde Bolton’s oldest child. After Olivia exposed my mother’s half-century-old lie, I told her that Mom had subsequently earned a master’s degree in Spanish literature. It was the late ’60s and my mother talked her way into the program — secure in the fact that a university transcript was impossible to retrieve from Cuba. I’m not surprised that my mother, a life-long fantasist, concocted this ruse. At this point, I think she actually believes that she went to the University of Havana. Since my mother’s interview with Leslie this past summer, I’ve tried to talk to her about her undergraduate status. I pointed out that the University of Havana had closed in November of 1956 and didn’t reopen until 1959, when she was already in the United States. There was no way she was in class in March of 1957. She screamed that maybe I was book smart, but I had no common sense. Whatever book smarts I have, I owe them to my mother. I’d go wide-eyed each time she told me that Miguel de Unamuno lost his faith when he was just five years old. My bedtime stories revolved around Don Quixote’s adventures with the hapless Sancho Panza. Mom made her own stunning montage of narratives. And in the process she educated the both of us.